Alex was introduced to fly-fishing in 1994. He is now totally consumed by the sport, and loves to fish for trout with light equipment and small flies. His home water is the Grand River and its tributaries, where he can be found fishing his beloved 0wt. That’s the opening sentence of the entry in my newly organized fly fishing log for May 7, 2001. It describes an afternoon trip to Whiteman’s Creek, a spring fed cold-water creek that is a tributary of the Grand River and is located west of Brantford, in Southwestern Ontario, Canada. The creek is one of my favorite spots and I have spent many enjoyable afternoons there chasing rainbows and browns. The fish are not large, usually 12-14 inches, with many smaller ones in the 8-10 inch category. The largest I had caught in the three years previous to May 7 was 15 inches. The rainbows are very acrobatic and the browns are scrappy enough to make hooking them and landing them with a 0wt rod great fun. I live in London, Ontario and generally fish the tailwater brown trout fishery of the Upper Grand River. A trip to the Grand takes the best part of two hours, one way. I go there a minimum of once a week during the season, usually on Thursdays, with one or two fishing buddies. Because of the distance, a trip to the Grand has to be an all-day trip. Whiteman’s, on the other hand, is only one hour from home, so whenever I can find an afternoon, I’m off to Whiteman’s. I left home at one o'clock in the afternoon and was on the water by 2:15. My way of fishing the creek is to walk downstream for quite a distance and fish all the way back to the access point by dark. May 7th was overcast and the water temperature was 13 degrees Celsius (55 degrees Fahrenheit). I had never before seen that many insects hatching and flying in the creek area that early in the afternoon. The fish were extremely active. It took a lot of self-control not to go in the water until I reached my usual starting point. I saw rise after rise all the way down my downstream walk. As far as I could make out, the hatch was a mix of Hendricksons and BWO. As I started to fish, it was obvious that it was going to be a very good day. 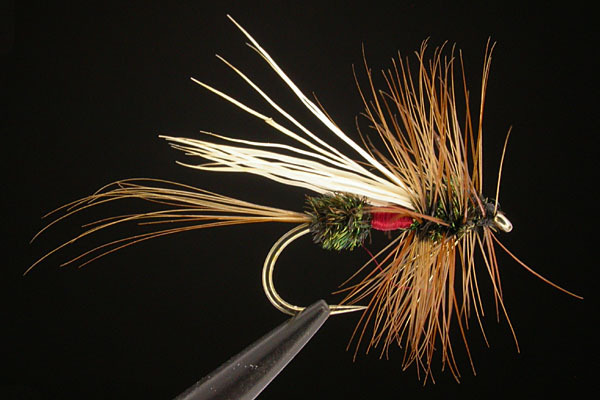 My starting fly was a #16 quill-bodied parachute BWO. Although I got some takes and landed two fish with it, my impression was that the takes were not consistent enough and there were too many observed refusals. So I went to a #16 parachute Adams, followed by a #14 Adams. The results were slightly better than the BWO, but again I had the impression that the fish were not delighted with what I was offering. And then it happened! On a whim, I tied on a fly that I had never used before. In fact I had only tied a few, in sizes 12, 14 and 16, the week previous. I had found the pattern in the VFS (flyshop.com) archives and liked the looks of it. It is called a Wright’s Royal and it is a variation of the Trude tie of a Royal Wulff. Since the size 16s in the two other patterns I had tried were somewhat successful, it was a #16 that I put on. The fish went nuts! They kept me busy for the three hours that followed, and I lost count of the number of fish I landed after number 15. The fly was also responsible for my largest brown ever on Whiteman's. I was drifting the fly very close to the side of a large deadfall in fairly fast flowing water. I had found fish at that very spot on previous occasions. The big brown came from under the submerged tree trunk, smashing the fly and scaring the daylights out of me. Fortunately, when he felt the hook, instead of going back under the log where I would probably have lost him in a snag, he took off downstream to a fairly deep snag-free hole where I easily managed to play him out and land him. This 18-inch brown trout. Photo by Alex Vardanis at Whiteman's Creek, May 7, 2001. I was alone, and it is just as well that no one was watching. I proceeded to impersonate a pretzel as I retrieved my camera from the back pocket of my vest while holding the fish netted in the water and holding onto my rod. I did manage to do it though and took a reasonable picture of the 18-inch brown. On the 0wt rod it was a blast! I took my time to revive him and sent him on his way upstream, with many thanks, where he probably took refuge under the same log. A day, a fish and a fly I will never forget. The Wright’s Royal has produced for me on a number of other occasions including a memorable day with Kamloops rainbows on a lake near Merritt, British Columbia. Hook: Size 10-16, TMC 900BL or equivalent dry fly hook. Tail: Brown hackle fibers (optional, but preferred by Alex). Body: Peacock herl, red floss, peacock herl. Wing: Light or bleached elk hair. Hackle: Coachman brown, palmered over thorax.